It’s common to associate healthy teeth and gums with regular brushing, flossing, and using mouthwash, but diet plays a very important part in dental health, too. You probably already know that acidic and sugary foods and drinks are bad for teeth, but do you know which foods can really give your child’s oral health a big boost? Packed with key nutrients, vitamins, and antioxidants. Naturally abrasive, so they gently scrub and clean teeth surfaces. Has one of the highest concentrations of vitamin C.
The least acidic citrus. Famous for vitamin C which makes for stronger blood vessels, less inflammation, and healthier gums. Have a neutralizing effect on acids. Packed with Vitamin C, antioxidants, and malic acid, which acts as a teeth whitener. Contain lots of the most important minerals and vitamins for your mouth. 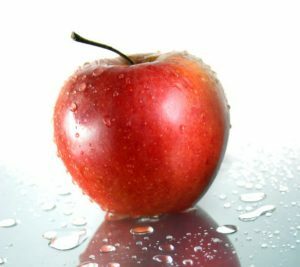 Like apples, are natural teeth scrubbers. The closest thing to nature’s floss. Rich in calcium, folic acid and many vitamins and minerals that are superheroes for teeth and gums. Contain vitamin A, which is essential for tooth enamel and gums. Rich in calcium, fights plaque, increases saliva production. Rich in calcium and other minerals, fights plaque and tooth decay. Contains calcium, of course, but also probiotics that protect against cavities, gum disease, and even bad breath. Contains polyphenols that reduce bacteria and toxic products of bacteria in the mouth. Usually rich in fluoride. Keeps saliva production levels high which fights tooth decay. Also washes away bacteria. All meats are packed with vitamins and minerals important to oral health, such as B12, iron, and zinc to name a few. High in antioxidants. Rich in calcium and phosphorus, the building blocks of enamel, which also help to fight bacteria and tooth decay. High in calcium and very efficient at scrubbing plaque off teeth while you chew them. Remember to keep a balance – good food and good dental habits. Don’t forget what your child’s dentist recommends for brushing and flossing. At Adams & Seaton Pediatric Dentistry, we recommend a preventive care office visit every 6 months. Learn More. If you are searching for the top kids dentist Nashville has to offer you’ll find a pediatric dental practice in Adams & Seaton Pediatric Dentistry that provides the highest quality dental care in a relaxed, non-intimidating environment. For additional information or to schedule an appointment please call (615) 297-7597. We look forward to the opportunity to serve your children.